SERIOSULY,I WAS TYPING IN "Metal Slug Fancharacters" to have a brief preview of how others portray their Fancharacters. AND LOOK WHAT I FREAKING FOUND. Although I have nothing against that picture but I find it...bizzare. Krystal fans FTW? 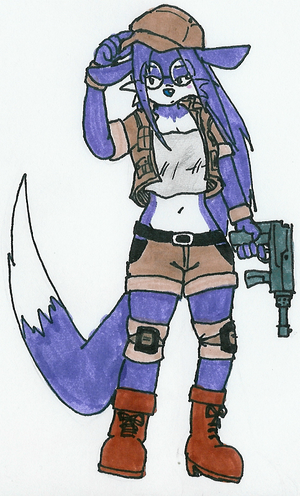 It's like Krystal and Fang the Sniper's daughter. Krystal and Fang had a last night stand. There must be fanfiction about this... TO THE INTERNET! I once read a terrible fanfiction about Sonic not being able to run and losing one of his legs and parts of his spinal cord. As Dark Jandroy would say: I would shoot her. Subject: Re: Metal Slug Fancharacter? !